Congratulations to all riders, exhibitors, trainers, and owners for their successes at the Annual Rotary Horse Show held at CEC in March! Next up is the Annual Kiwanis Horse Show, to be held at CEC on April 18 & 19. 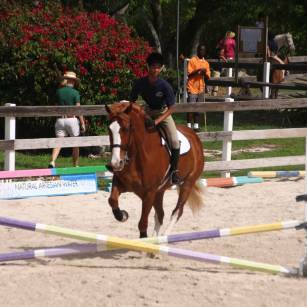 The highlight of the show will be the Bahamas Junior Classic Final, which will be held on Sunday, April 19. USEF ‘R’ Judge Lori Arnold will preside. Over at the Global Dressage Festival in Wellington, FL, Liz McConnell and the team from Sugar Apple Farms are having a very successful season! At Dressage Festival 12 (March 24-28) Megan McConnell took 1st place in Dressage Seat Equitation (74.502%) and qualified for Regional finals. Liz and Nancy Holowesko’s Roubaix gained two firsts riding First Level Test 3 (73.5% and 70%). As for our local favourite Steinway, Liz has been thrilled with his progress: Steinway achieved good scores at Prix St. Georges (65%) and Intermediare I (62%), and has now achieved the scores necessary to compete at International level!